Jim has over 25 years of experience leading clients and agency teams in strategic marketing initiatives of all kinds, from product inception and brand positioning to campaign development and integrated marketing programs. He has a deep understanding of both traditional and new media, and broad experience with both business-to-consumer and business-to-business marketing. Jim heads up Plan B’s client service department, leading various account teams with a focus on creating more collaborative and proactive client partnerships. He closely mentors a team of directors and executives on the fundamentals and best practices of expert account management as learned and practiced over the course of his career. 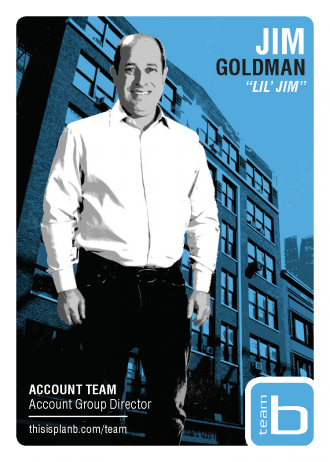 Jim is a steady, assuring voice of reason and a true advocate for agency success through client success. Jim’s breadth of career experience spans a wide range of industries, making him an exceptional utility thinker at the discovery phase, diagnosing a company’s or brand’s biggest obstacles to success and offering practical, proven pathways to sustained growth. Jim is well versed in the behind-the-scenes mechanics of how businesses of all kinds operate; his knowledge of systems and processes makes him adept at getting to the heart of a business problem. As a pragmatic problem solver, he swiftly architects smart marketing plans and proposals that address tough market challenges and take advantage of time-sensitive opportunities with precision. Throughout his career, Jim has been a hands-on leader who is passionate about the client businesses in his care. He takes a thoughtful approach to understanding their world, dissecting category dynamics to reveal true insights that can be used to inform the development of laser-focused project and creative briefs. From his many years in the trenches, Jim has cultivated an unparalleled understanding of what it takes to produce and implement highly results-driven programs. Prior to joining Plan B, Jim developed successful programs for nationally prominent marketers of all types, including consumer products, financial services, foodservice, and industrial products, working with household names such as Sears, HSBC Financial, Kraft, Sara Lee, Jim Beam, Arby’s, the Indy Racing League, and many others. When Jim isn’t working, he’s either at home in the Chicago Suburbs with his family or on the road with his son’s travel hockey team – the quintessential family man living the American Dream.